Posted at 8:50 pm on November 8, 2012 by Brett T.
Among all of the finger-pointing going on in the wake of Mitt Romney’s Election Day loss, one object of blame isn’t even human. Project Orca, the Romney campaign’s proprietary get-out-the-vote software, is getting a lot of attention for failing the campaign when it was needed most. PBS was given a quick overview of Project Orca earlier this week. The software was to help volunteers keep track of who had voted and identify those who hadn’t for follow-up. RealClearPolitics’ Erin McPike broke the news of Orca’s floundering on election night, much to the delight of Obama campaign staffers. According to GOP sources on the ground, Romney camp's "ORCA" turnout app has crashed, so they can't monitor their turnout operation. As an update: from another source in Boston, I'm told ORCA has been hacked, and those in charge of it are acting panicky at the moment. *ORCA, Romney turnout app *may* have been hacked; bottom line, GOP sources in several locales have confirmed something is amiss. #beached RT @ErinMcPike: According to GOP sources, Romney's "ORCA" turnout app has crashed, so they can't monitor their turnout operation. This is why the Republican Party needs to do major outreach with Silicon Valley. ORCA is nothing short of a failure. We're being laughed at. So, the end result was that 30,000+ of the most active and fired-up volunteers were wandering around confused and frustrated when they could have been doing anything else to help. Like driving people to the polls, phone-banking, walking door-to-door, etc. We lost by fairly small margins in Florida, Virginia, Ohio and Colorado. If this had worked could it have closed the gap? I sure hope not for my sanity’s sake. Others on Twitter concur with Ekdahl’s summary. 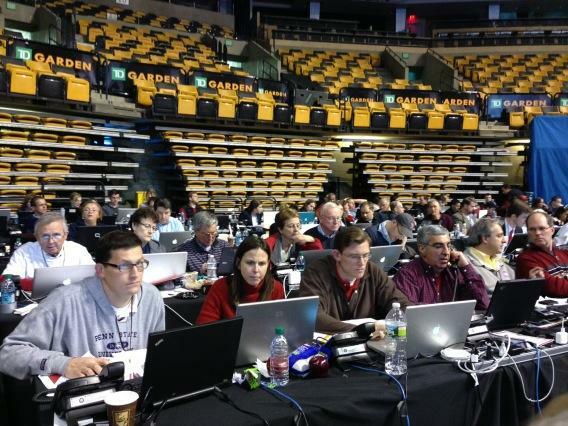 @michellemalkin @johnekdahl We never got packets so assumed they had more volunteers than they needed. @JohnEkdahl I was one of the 30K Orca vol. got my packet Mon nite. Was not allowed to observe nor was I ever able to connect to website. @JohnEkdahl I too was sup. to help w/ Orca. No packet, no polling place, couldn't get through on phone. Sent multi emails req info. No help. @JohnEkdahl Never received my materials either. Agree-huge waste of enthused volunteers. Local office knew little about Orca. @JohnEkdahl Thanks for sharing this. For days ahead of time I tried getting in touch with Orca HQ. No packet. No email. No call. I'm in VA.
Ouch. For now, even more volunteers are tweeting their own stories of confusion and helplessness. Project Orca certainly can’t be held solely responsible for Tuesday night’s results, but the stories from volunteers show that much more has to be done to win future elections than field a candidate and hope for the best. Okay, so ORCA sucked. Start working on something different NOW for 2014.